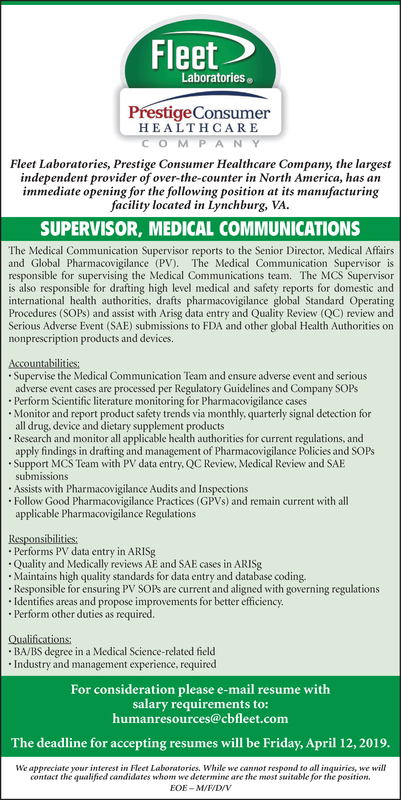 Fleet Laboratories, Prestige Consumer Healthcare Company, the largest independent provider of over-the-counter in North America, has an immediate opening for the following position at its manufacturing facility located in Lynchburg, VA. The Medical Communication Supervisor reports to the Senior Director, Medical Affairs and Global Pharmacovigilance (PV). The Medical Communication Supervisor is responsible for supervising the Medical Communications team. The MCS Supervisor is also responsible for drafting high level medical and safety reports for domestic and international health authorities, drafts harmacovigilance global Standard Operating Procedures (SOPs) and assist with Arisg data entry and Quality Review (QC) review and Serious Adverse Event (SAE) submissions to FDA and other global Health Authorities on nonprescription products and devices. • Maintains high quality standards for data entry and database coding. • Identifies areas and propose improvements for better efficiency. We appreciate your interest in Fleet Laboratories. While we cannot respond to all inquiries, we will contact the qualified candidates whom we determine are the most suitable for the position.